This is my classroom. Usually somewhat quiet with music playing in the background, the smell of a Yankee Candle burning in my tart burner, and students working away. I usually don’t hear too many complaints from students because we have a very structured schedule and do the same type of thing day in and day out. That is until I tell them that a project we have been working on is due at the end of the week. Shrieks, faints, and looks that say, “Oh my goodness!” abound in the room. By 4th grade a student must learn how to work independently and practice time management skills to complete a final project. 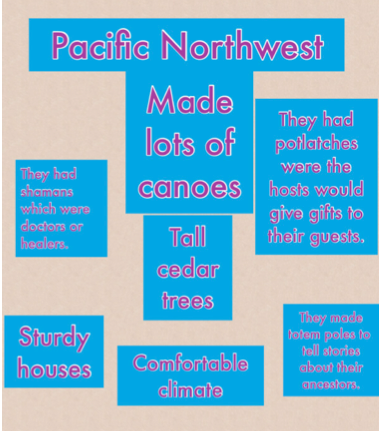 With every social studies and science unit I teach, students create ePubs that reflect our lessons using Book Creator. These ePubs hold all of the mini-projects (Poplets, iMovies, Pic Collages) we have created over the duration of the unit. Students have a say in the design and how they want things within their journals to look and they can always add additional material, but rubrics allow the students and myself to gauge what kind of grade they get for their work. Recently, students had a Native American journal due in class. We finished all of our lessons on a Wednesday, and if you had been creating and working on the assigned mini-projects every day you would only need an additional day to complete the remainder of the project and turn it in. What happens to those who didn’t use their time wisely and didn’t complete projects little by little? As an educator I have two options. Allow them to turn it in late and subtract five points from every day late (All the while the student will get behind on our current studies), or I could take the project for what it is and give them a grade that reflects their effort. What is the greater lesson? It is as important to teach skills such as time management and independence as it is to teach long division. In reality, students will actually use time management skills more than they will use long division. The answer to the above situation? Allow them to fail. Failure is one of the greatest lessons we can allow our students to learn. Humans learn from failure. During the next project, I bet those that fail the Native American ePub will not fail again. Technology and quality teaching allow us to reach students and help them understand how what we do in the class effects them in the future. Deadlines. No one really likes them, but we have to have them.